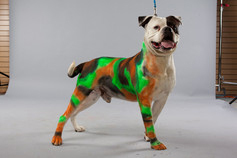 PetPaint is a color hairspray for dogs that is an affordable and safe alternative to pet costumes for dogs. Revolutionizing how people "embellish" their dogs for holidays and events, Pet Paint has been tested again and again to ensure its ability to last and its overall safety. Be as creative as your pet will allow and skip the nonsense of traditional pet costumes for dogs. PetPaint is a high quality colored furspray that is specially formulated, dog-safe, and veterinarian approved. The company was founded by Abe Geary, who sought to change the way people celebrate occasions and holidays with their dog. After the establishment of clinical protocols, and rigorous formula testing, PetPaint was conceived. PetPaint is a quickly expanding color spray line for dogs built on creating a lasting relationship between dogs and their owners. It's a great way to put a smile on anyones face whether that is at a family reunion, holiday gathering, or birthday party. Also don't worry PetPaint is super easy to wash out and there's enough paint to be used on more than one occasion. At PetPaint we believe in safety, creativity, and having fun. We hope you do too! Check Out What We're All About! !